To share pictures from iPhoto, from the File menu, choose Share iPhoto with iChat Theater and select the pictures you want to show off. You can even present an album as a slide show, provided you have iPhoto ’08 onboard. To share files that aren’t pictures in iPhoto, from the File menu, choose Share a File with iChat Theater and then select the files you want to share. If you’ve already begun your video chat, you can merely drag the item into the video window. You’ll be asked whether you want to share the file through iChat Theater or send it as a file transfer. If you’re not sure whether you can share one of your files in iChat Theater, highlight the item in Finder and choose Quick Look from the File menu. 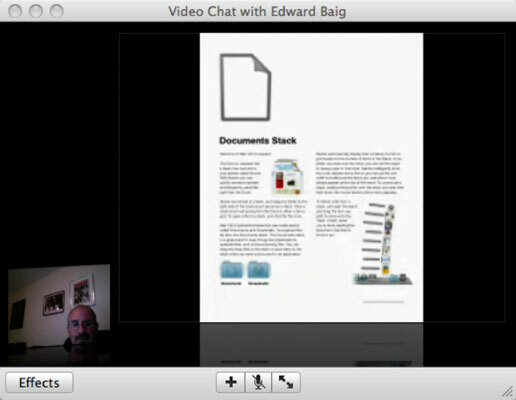 If you can see the file, so will the person you want to show it to through iChat Theater.